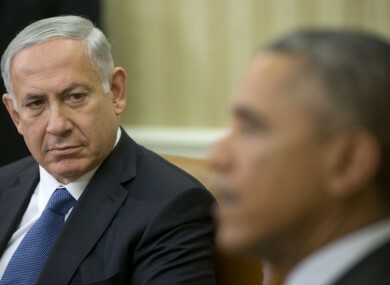 Top Obama official: Netanyahu is a "chickenshit"
The unnamed staffer also called the Israeli PM a “coward” in a newly published article. THE INCREASINGLY FRAUGHT relationship between the Obama administration and its Israeli counterparts has reached a new low of a top US official was quoted as calling Benjamin Netanyahu a “chickenshit”. The remark was made by an unnamed official to Jeffrey Goldberg, a reporter for The Atlantic magazine. In an article published yesterday, Goldberg said the official referred the Israeli Prime Minister by his nickname. “The thing about Bibi is, he’s a chickenshit,” this official is reported to have said. In the article, the official also referred to Netanyahu as a a “coward” on the issue of Iran’s nuclear threat. The criticism is the latest in a series of clashes that have erupted between the two administration, particularly in response to Israeli plans to build new settlements. President Obama is also reported to have had some forthright conversations with Netanyahu over civilian casualties in Gaza but the US has consistently supported Israel’s actions. The Israeli Prime Minster has already responded to the the reported comments with with Haaretz quoting a Nentanyahu official who said, ”Netanyahu will continue to uphold the security interests of Israel and the historical rights of the Jewish people in Jerusalem, and no amount of pressure will change that.”. The official was referring the criticism the Israeli administration has received over the past two days following the announcement that it was to build over 1,000 new settlemnts in East Jerusalem. Email “Top Obama official: Netanyahu is a "chickenshit"”. Feedback on “Top Obama official: Netanyahu is a "chickenshit"”.